Every Monday I look forward to seeing the cartoon that Tom Fishburne comes up to start the week off. 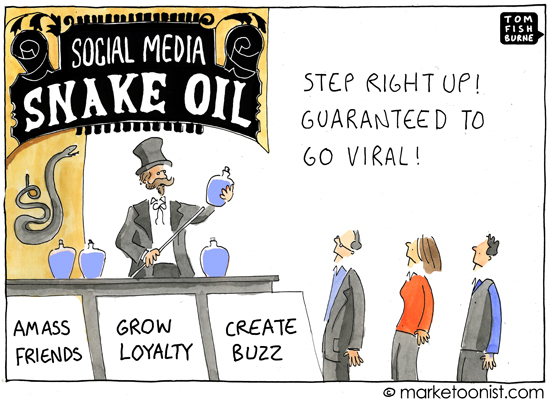 This weeks cartoon was another nail on the head for digital brand marketers everywhere. Recently, I was working with a friend and she was asking about how to create a viral strategy for her product launch. My response – same as it always is when agencies or marketers ask this question – “Viral is not a strategy, it’s an outcome”. Brands and their agencies spend a lot of time conjuring up “viral strategies” and on a good day about one percent actually go viral. And for the ones that do, it’s truly a combination of stellar creative, an excellent story and a payoff (for the consumer) that has a great and fun twist. And a many of the most successful viral campaigns are not what most brands would consider “brand safe”. For the brands that understand the differences between strategy vs. outcome and how to push the envelope of brand safety, the viral world is yours to enjoy!